I am a pediatric physical therapist and a writer. I work with children ages 0-3 and write about everything. A Rose For Jonathan (AR4J) is a Christian fiction that has been a finalist in the National Indie Excellence Awards for the Religion category, the winner of the Religion/Spirituality category for the New Apple Book Awards for Excellence in Independent Publishing, and now a bronze medalist in the Readers' Favorite Book Award contest. The sequel to AR4J is coming soon! I keep my writing clean and I love to add twists. I hope that you will let me know what you think about my work and look forward to hearing from you! The quote by Alexander Pope, “Fools rush in where angels fear to tread,” whispered in my head as I read A Rose for Jonathan. Contrarily, Beth Green depicts the angelic realm with boundless and fervent bravery, ever watching over their assigned humans, and graciously heeding the voice of the Father. In this compassionate story, the angels fear nothing; instead, they dare the angels of darkness to tread lightly. Beth Green does a wonderful job at portraying the despair and heartache of losing a child. She reveals the truth that everyone grieves differently; pain is very real and individualized. Moreover, Green uses her experience as a pediatric physical therapist to give insight into the organ donation process. Too often, we forget that someone has to die in order for someone else to live through organ transplant. This story delicately yet decisively weaves together the concept that there is a constant battle for the souls of humankind. Jesus Christ paid the ultimate sacrifice; He died that we might live. A Rose for Jonathan's resounding message is that we as believers are overcome by the blood of the Lamb and the word of our testimony. Since I was a little girl I have been enamored by stories. My best memories involve books: being read to by my mom who also loved stories, waiting beside the roadside for the book mobile to stop, reading Alice in Wonderland while buried under the covers when my mom didn’t know how to work the thermostat our first day in our first home with central air conditioning, and making it through those dreaded camping trips with the help of a stack of books. As an adult I discovered Christian fiction, stories that enlighten as well as entertain. I have always believed that God has a way of putting the right book in my hand at the right time. At times it is a book that has been on my shelf for years, and at others it is a book recently acquired. Some books are like the parables of the lost sheep and the lost coin (Luke Chapter 15), with a fairly easy theme to recognize. Others cause me to ponder at a deeper level and seek God’s wisdom, like the disciples in Luke Chapter 8, asking the meaning of the story. Others spark a longing to dig deeper into God’s Word looking for truth. A Rose for Jonathan is just such a book. I belong to a closed Facebook group where Christian authors link up with reviewers. I saw a post from Beth Green; while her book looked interesting, it was the fact that she was located in Baker, Florida that caught my attention. I messaged her and asked to be considered for receiving a copy of the book to review, and asked whether or not she knew relatives that had lived in Baker. As it turned out she and her husband were vacationing there, but I believe God used this to place Beth’s book in my hand. As I am reading a book for review, I’m always thinking about wording my review. As I got into A Rose for Jonathan, I was considering connecting with fans of Frank Peretti, Ted Dekker and maybe Randy Alcorn as the story is occurring in the earthly and spiritual planes. I was thinking about incorporating the underlying theme of the importance of organ donation. Then I was increasingly convicted that I was reading this book not as a way to promote Christian fiction, but because I needed a wakeup call in my prayer life. When I first retired I felt God’s call to spend significant amounts of time in prayer, and to pray utilizing Scripture. He gave me tools to assist me in this, one of the greatest being the book Prayers That Avail Much from Word Ministries, Inc. Over time I allowed a new kind of business to enter my life, and my prayer life changed. I continued to pray quite often, but my prayers lacked the intensity that they’d had early in my retirement, and they included less Scripture. To be honest they were less effectual, but as all things that happen gradually, it went unnoticed. That is until God, through Beth Green, gave me A Rose for Jonathan. Paul tells us in Ephesians 6:12 that we struggle against the powers of this dark world and against the spiritual forces of evil in the heavenly realms. He instructs us in verses 13 through 17 to put on the full armor of God. Beth Green points out that some of the armor is defensive in nature: the belt of truth, the breastplate of righteousness, the shield of faith, and the helmet of salvation. Our offensive weapons are the sword of the Spirit, which is the Word of God and prayer. Paul reminds us in verse 18 to pray in the Spirit on all occasions with all kinds of prayers and requests, and that with this in mind to be alert and to always keep on praying for all the saints. I most highly recommend A Rose for Jonathan. The story of Pastor John, his wife Lindsey, his daughter Rosie, and all those whose lives they touch will grip your heart. Indeed fans of Peretti, Dekker and Alcorn will be blessed to meet a storyteller who is their equal. Who knows, there may be a reason that God is bringing this book to your attention at this time, or it may simply be your time to enjoy a great read. Either way, I couldn’t recommend a better book. Thank you to Beth Green for providing this book for my honest review. I did not receive any monetary compensation for a favorable review and the opinions expressed here are strictly my own. One of the best books I have read in quite a long time. This book is a fast read with a lot of issues addressed from spiritual warfare to the importance of organ donations. The characters are full of depth with humor, drama, and suspense all wrapped up in one. I had trouble putting this down and finished it rather quickly. My prayer life is officially revived! Don't miss out on another slam dunk by this new author. What a great book. The warfare that went on got me to thinking how much could my prayer life make a difference in the life of someone close to me. I have taken prayer for granted thru out my years as a Christian, but no longer. I was blown away by this book. The tie ins were incredible, the transitions are flawless, the story grabbed me from the beginning. This content will challenge people without being offended or beaten over the head with a bible and without the person knowing that they are being reached. Great read do not miss it. ★★★★★ This book portrayed an amazing story of spiritual battle between angels and demons. I loved the drama as Pastor John and his family were struggling with the traumas of death and loss. We saw the power of prayer and scripture sustaining the characters during their life crises. The author skillfully integrated the vital benefits of organ donations into the story line. Pastor John pondered the gift he and his young daughter received as he ministered to others. I was honored to be an early reader of this book in exchange for an honest review. I rate it a 10. It gave me goose bumps. Warmed my heart. Bought me to my knees in prayer. I read it until 5:00 am I couldn't put it down. God was really with you as you wrote this book. You touched on real life. We are living in a broken and dark world . I love the way it all came full circle. How you tied it all together. And the bible verses awesome. God bless you! I will do my review. I'm just blown away and in awe at this book. I too believe in the power of prayer and Bible scriptures , using them together. Because God blesses his word! God has blessed you with a special gift. Your understanding and use of the Bible scriptures is very enlightening and uplifting. "A Rose for Jonathan" awakened me to the awesomeness of our Heavenly Father and the spiritual beings that surround us...be they demons or Heavenly Angels. If we would only pray (keeping a prayer on our hearts always) how different life could be. We would have peace and gain understanding and strength for living. Thanks for listening to your Heavenly Angel....Proverbs 100:3 comes to my mind. I was asked to write a review of the book "A Rose for Jonathan" by Beth Strange Green. If you are a Christian and like to read AT ALL, you will enjoy this book. It reminded me of the first book I read about spiritual warfare (Frank Peretti's "This Present Darkness"). The infinite power of prayer was presented so well and inspired me to get even more serious about prayer in my life. The book deals with a young family who face various life-changing difficulties. There is a strong thread of faith throughout that sustains them in their grief and in joy as well. The characters are people you might know, they are so well developed. The story is told with a range of humor, suspense, drama, and faith all rolled in together. The author, Beth Green "The Green Author", is a pediatric physical therapist and brings her special affinity for children to the forefront as she discusses the subject of organ donation and transplantation. The story is woven in a masterful way and I highly recommend it for your next read. It's available on Amazon and other venues. The author, Beth Green "The Green Author", is a pediatric physical therapist and brings her special affinity for children to the forefront as she discusses the subject of organ donation and transplantation. The story is woven in a masterful way and I highly recommend it for your next read. Other than the Bible, I have read few books that have impacted my life as poignantly as A Rose For Jonathan! That says a lot seeing that this is a novel and not a Christian studies book. Beth Green masterfully weaves a plausible picture of the battle in the heavenliness; so much so that now when I pray I can actually visualize the war of good and evil that is taking place. I found that the character development brought me into the lives of each individual and rejoiced as they were all brought closer to God. The emphasis on organ donation even opened up conversations for me with my children. 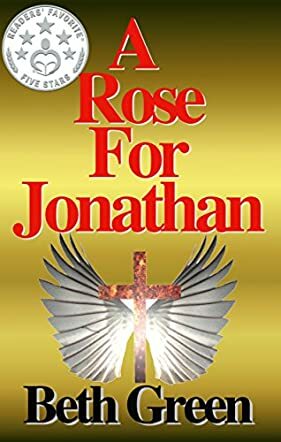 I believe that A Rose For Jonathan will impact every reader through causing introspective evaluation into ones own beliefs about God, prayer, angels and demons, and the impact of organ donation. It is my sincerest hope that this book changes peoples lives like it has positively impacted mine! Has reminded me to be more mindful of how important it is to pray for others and how there is spiritual warfare occuring all around us- and our prayers can impact the outcome! I loved this book! The story is written so well that you don't want to put the book down. Romans 8:28 is one of my favorite verses in the Bible. This story is an example of how God can bring good out of tragedy. The author gives a great description of the Angels guarding the Pastor and his family. I don't want to give too much away about the story. It is a great book! This book sat in my to be read pile for months, and I decided to read it! What a wonderful surprise!! The book was about how organ donations can be a blessing, but the author used a backdrop of spiritual warfare to bring the story to life! What an awesome way to tell the story! This is a must read! Wow! What an amazing book. So real and so true! Everyone should read this book and know not only are there angels among us but their battle with the forces of evil are real. Prayer and scripture are our only offensive weapons! I've been challenged by this book to use them more frequently! Thank you Beth Green for sharing this gift with us in this book. May God bless you as you continue to write for Him! I just finished Beth's book while on vacation. I honestly read it in two days and could not put it down. I do believe in the power of prayer and Beth's beautiful and spiritual story supported and validated my beliefs. It would be a wonderful gift for someone that you love and care about or perhaps an acquaintance needing a little spiritual lift. God Bless Beth....hope she is planning to write a sequel or another book! Pastor John's personal mystery spills over to the life of a young man burdened by guilt. The young man is plagued by a previous tragedy that was used by God to bless several lives. The author keeps you eager to discover the connection. If you believe in faith and the power of prayer you will love this book. This book holds your attention and makes you think. It has a great story but more importantly a message all of us should take to heart. It made me wonder what if we all took time to pray, how might our world be differnt? It had good insights into loss and how people react to it. Great perspectives of how a minister lives as well! Powerful, entertaining and written by a person with deep insight. This would also be a great gift for a friend! Loved this book! Fast paced, easy read with lots of details!! I definitely recommend it to anyone. Beth Green does a wonderful job for catching your attention and keeping it. Most people want to ignore the spiritual word and the battle that goes on there. She shows how the two can work together and how things in our world never goes as planned. It is a touching story that reinforces the saying that when much is given much is required. It is not always easy to understand or accept. Frank Pertti better watch out because you show the same things but managed not to keep me awake at nights. What a wonderful and inspirational book! It increases your faith in prayer. I believe that heaven is all around us and that God sends his angels to protect and encourage us. I highly recommend this book. A great read! I absolutely loved this book. It was amazingly well written and the story carried you through the whole book. Beth Green does an amazing job. I think we do all have guardian angels guarding us. Pastor John reflects all of us in life as we try to learn what God's gift is for us, however even though most of us are searching, a lot of times we don't want to embrace what has been given to us. Too hard, too unbelievable. And of course, evil always lurking to pounce on any type of chink in our armor. A Rose For Jonathan is a book everyone should read. If you are a Christian and like to read AT ALL, you will enjoy this book. It reminded me of the first book I read about spiritual warfare (Frank Peretti's "This Present Darkness"). The infinite power of prayer was presented so well and inspired me to get even more serious about prayer in my life. Beth, what an inspiring and well written piece of work. I love Christian Fiction, and this book really delivered. The strong underlying theme for me was the power of prayer. We don't realize the power we have by just communicating with the Father, and praying scripture back to Him. The power of story is very important here as well. Never hesitate to share what God has done in your life, you never know how it will impact another. Well done! This book definitely deserves a 5 star rating and one of the best spiritual books I have read in a long time! It is most definitely fast paced! I can definitely relate to the spiritual world. It was when my mom passed. I won't go into details but as there are angels there are demons. The worst demon of the soul is pride and fear. "Pride go before a fall" says the Lord our God. Another favorite quote of mine is " I will never leave thee nor forsake thee"
please read this book it is awesome!!! I feel that I am much closer to God after reading this book. Praise God that I am blessed! ! Thank you Beth Green for a wonderful story about the spiritual world. Read this book over the weekend. Absolutely loved the storyline and it really made me think. I truly believe that angels and demons are real and this book had a good storyline that brought it all together at the end. An easy, fast read that will keep you guessing! A fun read that pushes readers back to prayer. Enjoy the ride!